Chocolate has a special place in my heart. The very thought of it sets my mouth water and so when it comes to baking a special cake, a 'Chocolate Cake' comes to mind at the very first instant. I have made it quite many times and it has always been a hit. 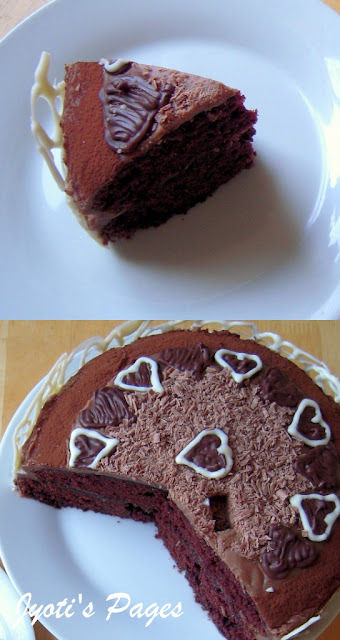 I love this recipe because it is eggless (it has to be) and infact vegan(with no butter or dairy product, I mean just the cake not the frosting). I am not vegan, so I didn't go all the way to make a vegan frosting. This cake recipe was passed on by a friend and I had jotted it down in a paper.I don't where I kept it but I know its somewhere safe ;-). So, I googled for one and found this. It is a very easy recipe with no fancy ingredients, even beginners can try it. I made it for our 3rd marriage anniversary and needless to say, it was a hit! 1. Preheat the oven at 180 C and grease two 8 inch round sandwich tins. 2. In a large bowl mix all the dry ingredients and shift so that it is well mixed and uniform. Make a hole in the centre. 3. Add the oil, vanilla extract and water and whisk it to combine it all. Add the vinegar and very quickly blend it lightly. Immediately pour the batter equally in the greased tins and bake in the preheated oven for 22-25 minutes. 4. To test if its done insert a skewer in the middle and if it comes out clean, cake is perfectly baked. 5. 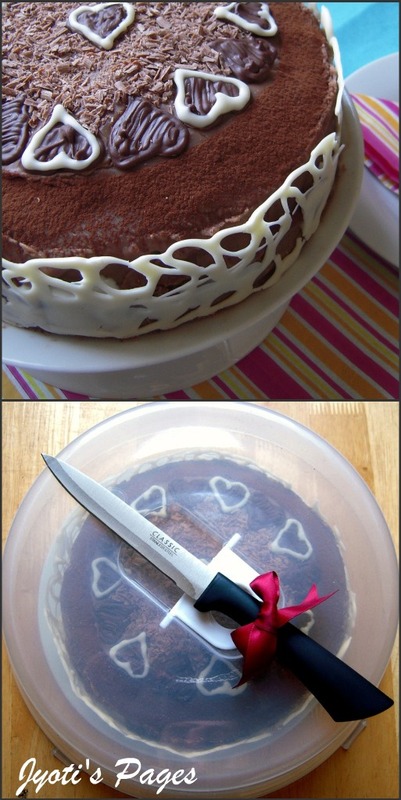 Take it out and run a knife through the sides of the cake and let it rest for 15 minutes to half an hour before taking it out of the tin. 6. Cool it completly before proceeding for the icing. 1. Chop the chocolate into small pieces. Pour all the ingredients into a heat proof bowl and place it over a pan containing boiling water. Stir the ingredients as it melts. The bowl should not touch the water. Alternately, you can microwave the chopped chocolates till it melts. 2. Take it off gas once nicely melted and beat well. Once the cake is cooled completely, place one half upside down and brush it nicely with the sugar syrup. It will keep the cake moist. 3. Pour the freshly prepared icing and cover it quickly. Place the second half and pour rest of the icing working it quickly before it is cooled and starts settling. With a warm palette knife smoothen it as quickly as possible. Grated chocolate, cocoa powder, chocolate hearts and chocolate lace border. That's a lot of chocolate I know but for a chocoholic like me its GREAT! :-) (huge grin)!! For chocolate hearts, I made outlines of little hearts on a parchment/greaseproof paper and turned it upside down. In a handmade cone made from parchment paper or plastic, I filled melted chocolate and closed the other end. I cut a small peice of the pointed end off the cone and filled the heart oultines with melted chocolate and left them to set. Once set, I lifted them and kept them in refrigerator till needed for decoration. I got the idea of lace border from here. Deeba's PAB is an inspiration for me and I am always awestruck by her pictures. This time the lace border was not that perfect, but I am sure it will be with practice. 1. After adding the vinegar, do not beat the batter much or else it will not rise. You have to be real quick at this stage. 2. It can be baked in 1 large 8 inch line and then slit it in the middle. But, I prefer to bake it separately. 3. Greasing the cake tin properly before baking and letting the cake cool down before taking it out it is very important. 4. The cake tastes great with or without frosting. It can also be served warm (30 secs in microwave) with a scoop of vanilla icecream and chocolate sauce! Here is a piece for you. ;-)! Perfect for an anniversary... Great looking cake...and nice frosting..
Gorgeous is one word which can best describe this cake...I am always looking for a best eggless chocolate cake recipe...so bookmarking this...thanks a lot for sharing this Jyoti. This truly deserves 5 stars!!! Gorgeous cake n the pics are real tempting..Great work Jyoti! yummy!.Very similar to the recipe i normally use(i think from Nita Mehta's book).Cute decoration.Have you tried transfer sheets? I'm not much of a baker, but this looks delicious! Wow this is even more brilliant..you seem to have taken a lot of effort !! Good job..